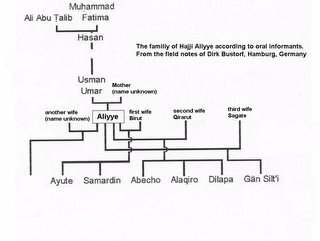 I have recently discovered that our tribe is not alone in claiming that "Futuh al-Habasha" records the ancestry of the Ashraf. Apparently the descendents of Shareef Ishaq b. Ahmed, or the Ishaqi tribe, in Somalia claim that the same writer and book has recorded the lineage of their ancestor. This is quite astounding - the claim of our tribe seemed dubious when it wasn't substantiated by another source. One could have claimed that the Silti in Ethiopia simply concocted the lineage of this Shareef and dubiously used a book that did not exist to bolster the claim. However the existence of another tribe with a similar claim; that the "Futuh al-Habasha" included other volumes, and information concerning genealogy; points to the truth of the claim. At the very least we can agree that Hajji Ali was not a native of Ethiopia and actually came from the Somali port of Berbera. We can also conclude that if other volumes of Futuh al-Habasha did not exist in the past - then at least the source of the claim did not originate in Ethiopia, but also came from Somalia. According to the tribe's oral history, the children of Hajji Ali became the chief ancestors of the Silti. 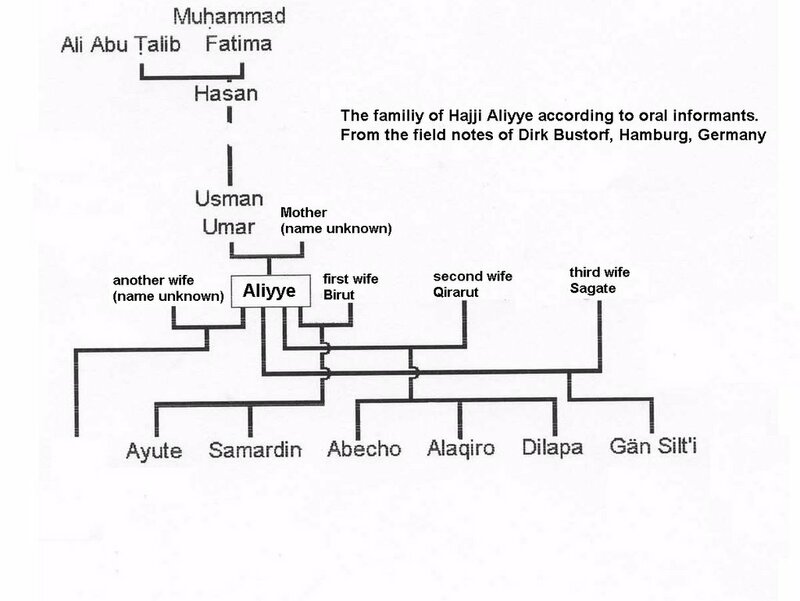 I thank Dirk Bustorf, a researcher of the Silte people from Hamburg University for providing the following family tree. The tree is the only "sure" information one can ascertain from oral history. Other details such as specific names differ depending on the source. While other sources may not have recorded their information in the original Arabic - the caretaker of Hajji Ali's shrine did so - that is why I feel he is our best source on the complete lineage. On a personal note, both of my parents are descendents of the son Samardeen, from the Arabic Thamr al-Din ( ثمر الدين). first thanks for this great blog about historical origins of the silte nationality(Not tribe).I think ther is a big differnce between "silti" and "silte", The former represents a region while the latter identifies the ethnic group. Please take caution in using the above two words. Other than that this is an excellent informational blog. To the Ashraaf brother, the sira of Sheekh Isxaaq Ibnu Axmed d.523 Hijra 22 Jamaad Awal can be found in the book wirtten by Maxamed Ibn Xasan Al Basri titled " Masjac Al Taariikh Wal Culuum" there is a copy in Asad libarary in Dimashaq. Maxamed Xasan Al Basri accompanied Sheekh Isxaaq and Si'ad Al Diin and Aw Qudub ( the ancestor of sections of the Sheekhaal buried in Sheekh town between Burco and berbera). The migartions of various Hashamites to Yemen and then to Somalia goes for long years.